We celebrated Clark's second birthday this past week. He is such a little man (other than the fact that he likes to pretend like he's a puppy and refuses to sit on the toilet). He sure has grown up though. He's learning how to get exactly what he wants. He's already a master of manipulation. This birthday cake was inspired by some of his recent manipulations. 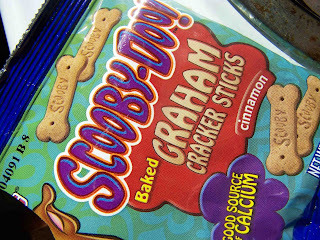 When we were on our trip visiting family, Clark discovered that my Aunt had these delicious graham cracker Scooby Snacks. He soon fell in love with them, and found out that if he would grab my Aunt's little finger and lead her to the kitchen, that he would be able to enjoy his new favorite treat. Another side small story, Clark's Grandma called him up early last week to see what he wanted for his birthday. Clark replied puppies. Later we asked him how old he was going to be, and he replied "two puppies". He seems to know how to get what he wants. 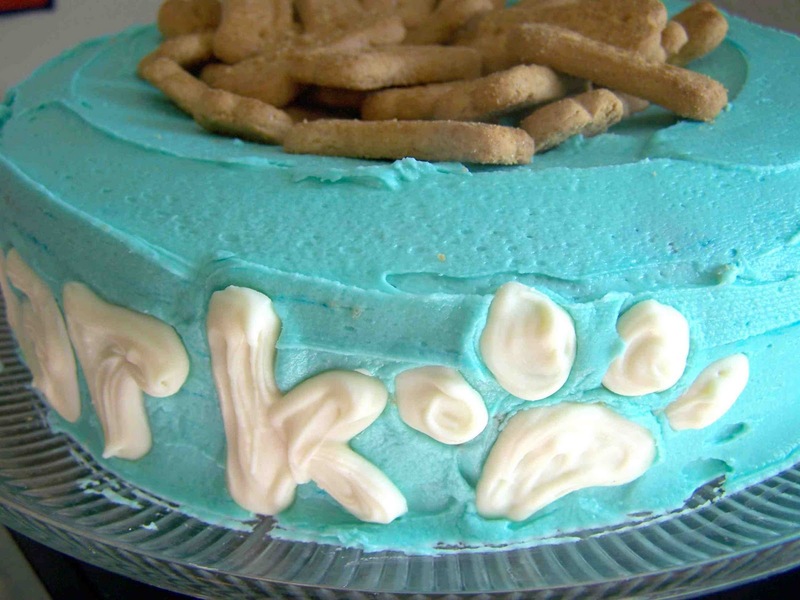 So in an effort to please my little man I made him a dog bowl birthday cake. 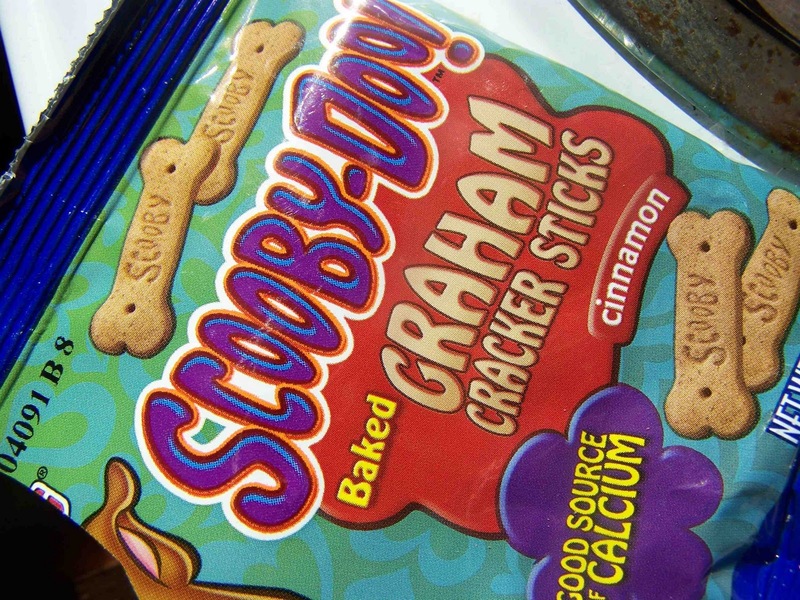 I used his favorite new graham cracker scooby snacks to fill the bowl. Here are a few little tips and tricks for this cake. Disclaimer: I am not a cake decorator, and would never profess to be. I deem my cake a success if it makes it out of the pan in one piece. I can barely use a piping bag, and I don't care that there are crumbs throughout the frosted layers of the cake. So if any of you fellow non-decorators are looking for a simple boy birthday cake, here it is. To learn how to make this cake click "read more" below. See the template in the top image. Move it around as you create shapes on wax paper. The first thing that I did in preparation for this cake was make some chocolate letters and paw prints for the side of the "dog bowl". To do so I melted the chocolate in the microwave (see directions on chocolate chip bag). I then filled a piping bag with the melted chocolate, and piped my letters and shapes onto wax paper. Now you could totally free-hand this, but I chose to make a template. 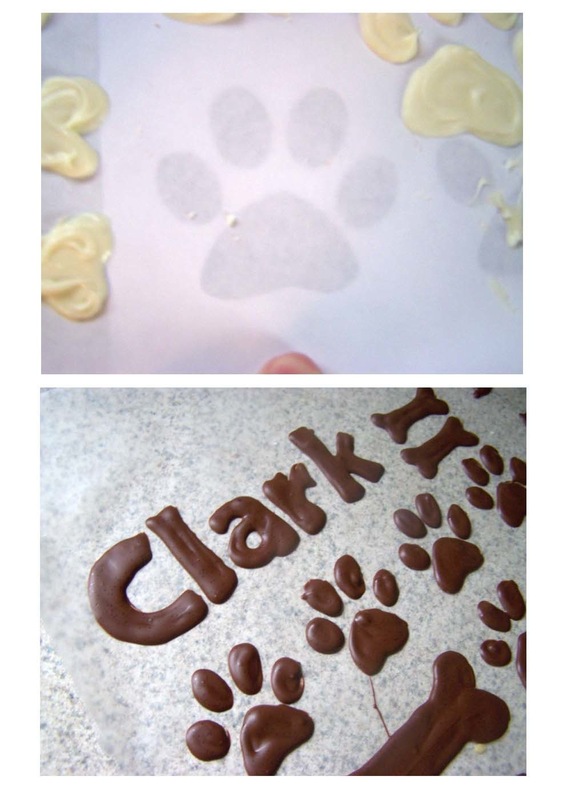 I went into Photo Shop Elements and used my custom shape tool to make some paw prints and san-serif letters. I then printed off my paper, slid it beneath the wax paper and used it as a guide. I tried piping the letters with both a star tip (white chocolate), and a circular tip (dark chocolate). I liked the circular tip better, but thought that the white chocolate would taste better with the fun-fetti cake. I am never pleased with how my frosted lettering turns out. This was more forgiving and added an additional texture to the cake. Note: I just used baking chips, the white chocolate was not as smooth and creamy when melted. A dipping chocolate may have been a better choice. Store chocolate letters and shapes out of heat and direct sunlight. This is one of my favorite frosting tricks. I read it on the back of a fun-fetti frosting container a few years back. 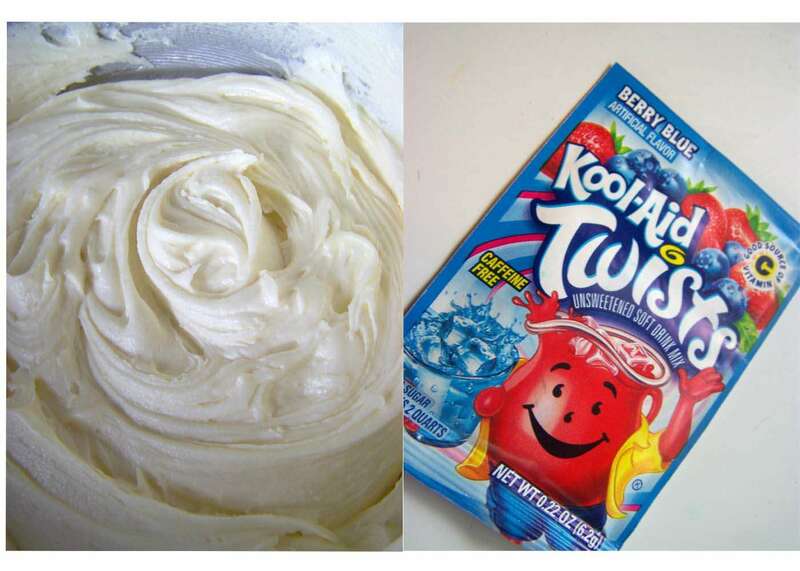 You mix in a package of Kool-Aid with a can of white frosting. I happened to make the frosting from scratch this year, and it worked just as well. I made quite a large batch (two cubes of butter), and then added one half of a package of berry blue Kool-Aid. 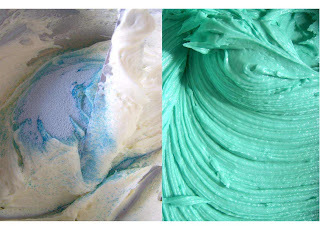 The Kool-Aid not only colored the frosting this lovely aqua color, but it also gave it a nice berry flavor. In the past I've found that a full packet of Kool-Aid can make it a bit tart, one half a package seemed just about right. Additional Tip: I also mixed in about 1/4 Cup of Marshmallow Cream to the frosting. It made the frosting nice and creamy. This is the part that you have a bit less control in. I was trying to figure out if my head the best way to make an indentation in the cake for the bowl. To my amazement, my cake fell. I couldn't have been more thrilled. 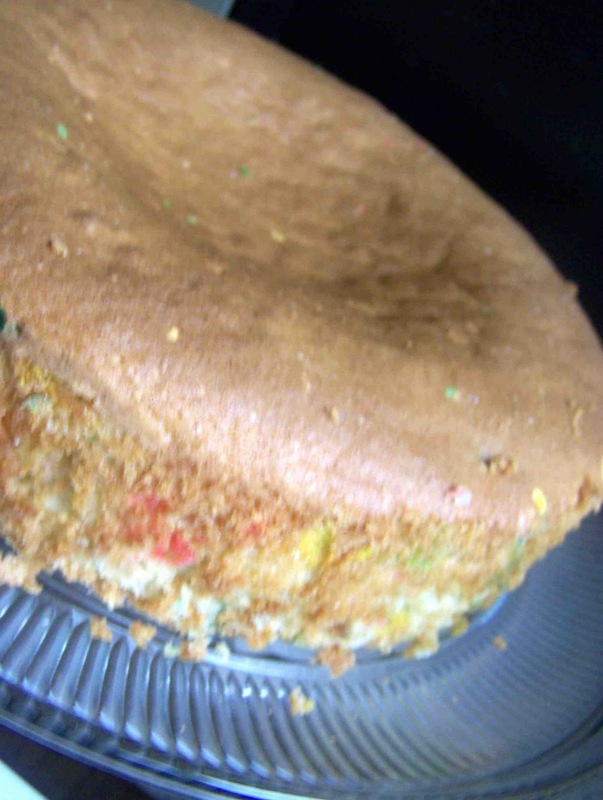 If your cake doesn't fall on its own you can always scoop out a portion of the top of the cake. The great thing about a fallen cake is that you still have a crust on the top of the cake, which makes for easier frosting. Once your cake is cooled you can remove the cake from your pan, and ice your cake. I didn't worry much about making the surface nice and smooth (because like I mentioned before I was just happy to get the cake out of the pan). Once the cake was iced I positioned the scooby snacks in the center of the indentation. Broken bones can still be used, just tuck them under the other bones. I then positioned my chocolate letters and paw prints on the side of the cake, and it was done. An easy peasy decorated cake. It is perfect for the little puppy lover. Clark loved his birthday, can you tell? 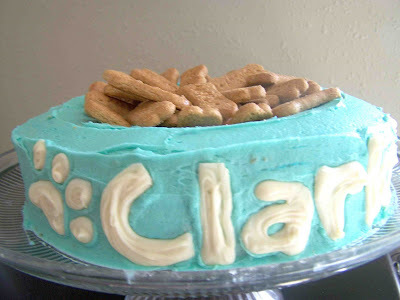 Note: This might not be the best cake if you are trying to teach your child to behave like a human, or abstain from puppy treats. I love this! I tried my hand at actually decorating a cake for my baby's first birthday... it was both a success (it looked good) and a failure -- I accidentally left one of the pan-lining paper towels ON one of the cake layers when I frosted it and my chocolate piping turned out terribly (probably because I don't actually have a piping bag and tips, just a plastic bag with the corner cut off :). I'll try again next year. Glad it was only the smash cake and not the cake for everyone to eat! Cuuuute!! I wish I had this a few weeks ago when I did my daughter's dog party! I'll have to file it away! Thanks! How adorable! Thanks for all your tips- I had a really hard time getting red frosting when I made my son's Elmo cupcakes. I wish I would have known about the Kool Aid trick...I'll remember it for next time though! too cute! he looks SO happy! LOVE this cake! I'm seeing it all over the link parties!!! Super cute! I'm a new follower! Love the cake! I made a dog Halloween costume when my 2nd daughter was small. She'd put the costume on and crawl around, so her big sister called her by the name "Play Doggy"! I love this cake! I want to have a doggie party just to have it!! Okay, this is just awesome! How cool is that birthday cake- you are a craft genius I tell ya! I think this is a very cute idea!!! Great minds think alike! 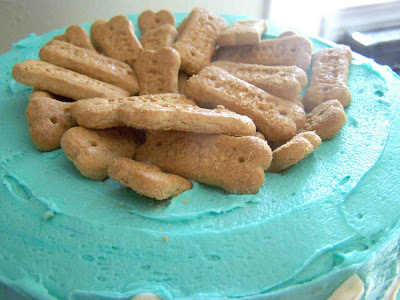 I made a version of this cake this past summer for my doggie Ollie's 14th Birthday! 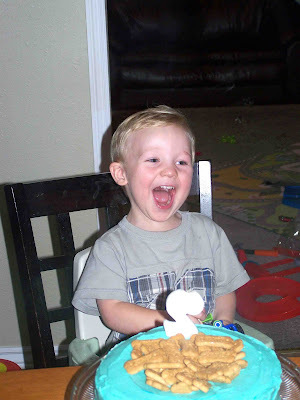 Instead of biscuits, I used cereal as the "kibble." This is so cute! I use to decorate professional in a store. I used the kool-aid in frosting, and you can get very good results!